The Hutchinson Lecture in Macroeconomics, which is sponsored annually by the Department of Economics, was established in 1990 to honor the distinguished academic career of the late Harry D. Hutchinson, a professor of economics who taught at UD from 1959-89. Each year a distinguished scholar and policy-maker is invited to present the Hutchinson Lecture in the spring semester. 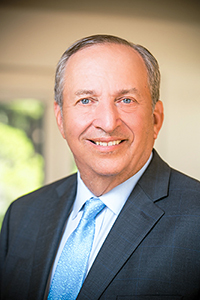 Lawrence H. Summers is the Charles W. Eliot University Professor and President Emeritus of Harvard University. During the past two decades, he has served in a series of senior policy positions in Washington, D.C., including the 71st Secretary of the Treasury for President Clinton, Director of the National Economic Council for President Obama and Vice President of Development Economics and Chief Economist of the World Bank. He received a bachelor of science degree from the Massachusetts Institute of Technology in 1975 and was awarded a Ph.D. from Harvard in 1982. In 1983, he became one of the youngest individuals in recent history to be named as a tenured member of the Harvard University faculty. In 1987, Mr. Summers became the first social scientist ever to receive the annual Alan T. Waterman Award of the National Science Foundation (NSF), and in 1993 he was awarded the John Bates Clark Medal, given every two years to the outstanding American economist under the age of 40.